The 92' Cheoy Lee, "Yoly," represents one of the finest values presently on the market. In 2015 she went through an extensive interior refit and has a complete refit engine. Features: Timeless styling, beautiful furnishings, and sumptuous seating features throughout the vessel create an elegant and comfortable atmosphere. 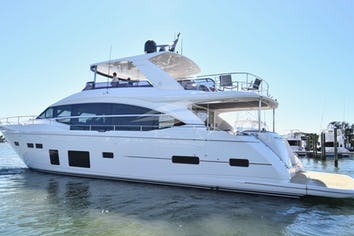 A semi-custom, Fexas-designed yacht, "Yoly," offers a floorplan with a four-stateroom galley-up layout. 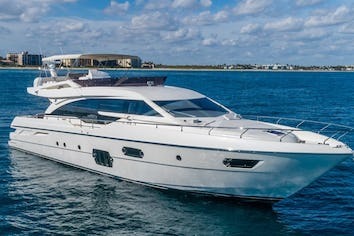 She sleeps up to 8 guests between the master suite, VIP suite, double cabin, and twin cabin all with en-suite bathrooms. The full-beam master suite includes a "his and hers" bathroom as well as a huge wardrobe and entertainment center. 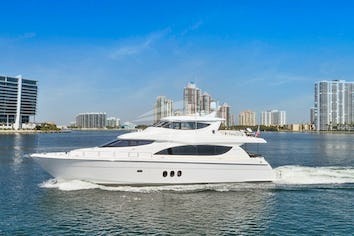 Additional features (among many) include a very bright, spacious, and open salon and formal dining area with large windows to provide excellent views while you enjoy the turquoise waters of the Bahamas, ample deck space, wide walkaround side decks, a large shaded aft deck, shaded alfresco dining option, plenty of lounge space on the flybridge, a flybridge hardtop, a deckhouse day head, a large swim platform, and a fabulous array of water toys. Caterpillar 1400 HP diesels will cruise the Cheoy Lee at 20 knots and reach 25-26 knots top. She is truly a beautifully styled yacht. Yoly's impressive leisure and entertainment facilities make her the ideal charter yacht for socializing and entertaining with family and friends. YOLY can sleep 8 to 9 guests in four owner/guest staterooms, all ensuite with its own full bathroom. There is an additional dayhead located on the main deck. Custom carpeting can be found on the sole in the main salon and staterooms. Galley Maid Delta heads freshwater flush, central vacuum system throughout. YOLY is beautifully decorated with Mahogany wood and Sapelle Pomelle (burl) wood, accents and elegant furnishings. The Master Stateroom is accessible by way of a private stairway leading from the main salon. This stateroom features a King size bed with ample storage beneath. Additionally there are separate "his" and "hers" master bathrooms which include a full size Jacuzzi with shower in "hers" and a stall shower with polished stainless steel mirrored ceilings in "his", and marble counter tops with drop-in sinks in both. The floors are marble with inlay tiles and the walls elegantly papered. Galley Maid Euro heads. The VIP Guest Stateroom is accessible from the salon via a stairwell which leads to all three Guest Staterooms. This stateroom features an island Queen bed. There is an entertainment center with a Toshiba TV/DVD, and Yamaha Natural Sound AV receiver. The ensuite bathroom boasts a Jacuzzi style tub/shower combination. There are granite floors, Vitricore walls and cabinets, Corian counter tops with drop-in sink and gold/crystal faucets. Guest stateroom, to port, features a Double bed. Guest stateroom, to starboard, features twin berths. Both have with storage drawers underneath, a cedar lined closet, a Toshiba TV/DVD, and Yamaha Natural Sound AV receiver. Their bathrooms have a polished stainless steel mirrored ceiling, marble floors, Corian counter top with drop-in sink, Vitricore walls, and a full size stall shower. YOLY is fully air conditioned through out. Crew has a separate heads and shower.